Tungsten Analysis: WC Preview Part 12 - Two more world champions! Three if you count the youth worlds! And someone who Wikipedia thinks might be a sailor! WC Preview Part 12 - Two more world champions! Three if you count the youth worlds! And someone who Wikipedia thinks might be a sailor! 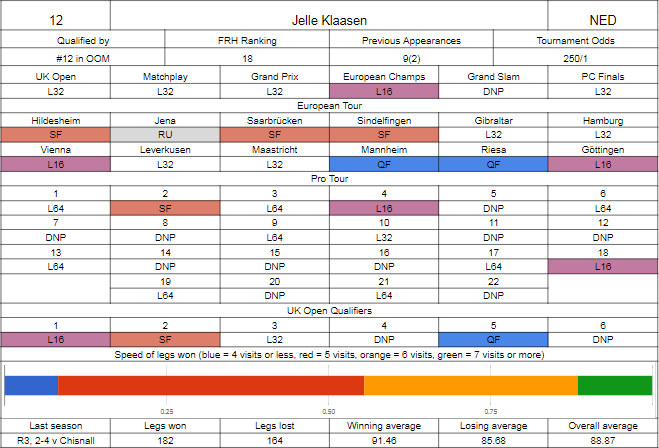 A potentially quite close all-Dutch tie first up, and we'll start by looking at the 2006 (yes, twelve years ago) Lakeside champion, Jelle Klaasen. 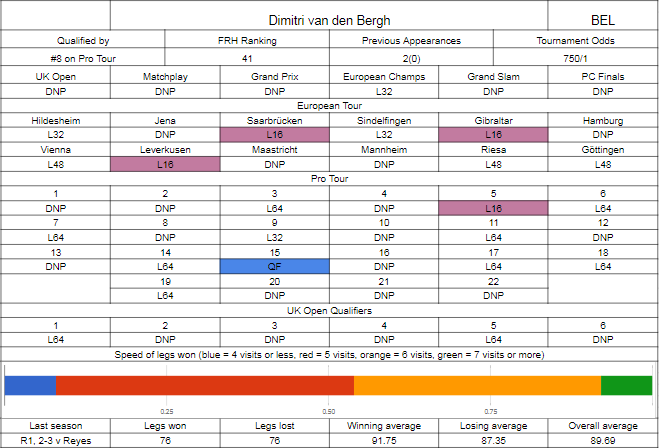 I think the first thing to note is his impressive European form, reaching a final where he lost to Michael van Gerwen, three more semi finals and the Sunday on a further four occasions, some decent consistency there given that for a lot of the early ones, he was working through a wrist injury that inhibited his game quite a bit, most notably in the Premier League where he couldn't get out of the bottom two. He was doing OK in the floor events early, claiming three board wins in UK Open qualifiers and getting a best Players Championship run of a semi final in the week before the UK Open, knocking off Barney in the quarters, but at the UK Open itself he was only able to get the one win over Jonny Clayton, losing out in a decider to Vincent van der Voort in the following round. Elsewhere on TV hasn't been too kind, he wouldn't have expected to lose to Justin Pipe at Blackpool, drew Dave Chisnall in Dublin and lost in straight sets, lost out to Robbie Green in qualifying for the Grand Slam, got a free win against Kist in Hasselt before losing to Kyle Anderson, and while he could get through Alan Norris in Minehead, he couldn't do the same against Steve Beaton. Most of those games are ones that he should be winning, so it's not surprising that his FRH ranking has dropped out of the top 16 coming into an event where he's defending a semi final prize. Dekker's still well the right side of 30 but seems a veteran of the game, such is the age that the Dutch players come through at, and he's making his second appearance on the PDC world stage, and will look to do better than two years ago where he lost in straight sets to Adrian Lewis. Dekker was able to get enough to qualify for the UK Open in the opening weekend, but couldn't add a penny to it in the second, so needed to beat Challenge/Development Tour player Rob Hewson to make the money, and couldn't. The rest of his season has been extremely hit and miss - while he's gone out in the first round in the Players Championship events on fourteen occasions, he won his board four times on the times he didn't, with a peak run of a semi final in April, knocking out Cullen and Chisnall before not winning a leg against Michael van Gerwen. It's similar in Europe, he didn't qualify for eight of the events, but won through to the Saturday in the four that he made, the Sunday in three of them, and a quarter final in Sindelfingen, only going out to eventual winner Peter Wright on that occasion. Those European runs got him to Hasselt, but he drew Michael van Gerwen in the opening round, who would also defeat Dekker in the other major he played, the Players Championship Finals - but there it would be a lot closer, as Dekker kept things incredibly close in the quarter final with nothing separating the players after fourteen legs, before van Gerwen held/broke/held to claim the win. That pushed Dekker up the rankings nicely, wins over Smith, Whitlock and Jacques giving him his biggest payday since the BDO semi final four years ago. 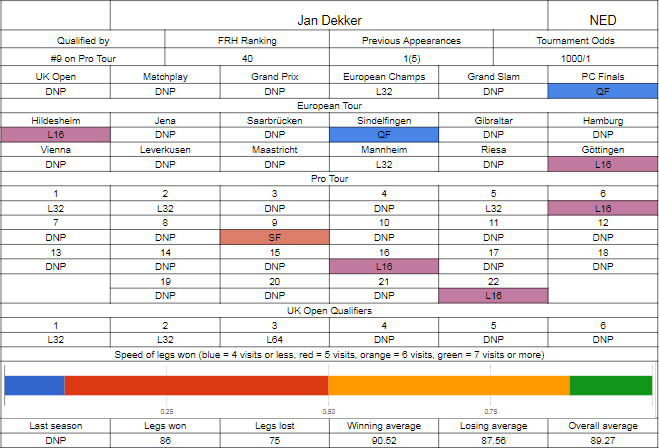 The stats look quite even, and it will come down to Klaasen's ability to produce - if he throws his best darts for long enough then Dekker shouldn't be able to keep up, but that's a big if - he scores better when he's winning legs than Dekker does, but worse when he's losing legs to the extent that Dekker's actually averaging more per turn overall. Dekker turning the form on at the right time might lean me to taking the outsider here. It's been another year in the struggle for Bunting to regain the form he showed straight after switching in what's widely been dubbed the second best debut season ever (copyright all Rob Cross appreciation minute producers), but of recent he's started to show small signs that he's going in the right direction. It wasn't that way early on, he couldn't get enough in the bank to make the money directly in the UK Open, drew Mark Webster, and then lost. It would also take him an incredibly long time to win a board on the floor - winning only five grand in the opening eight Pro Tour weekends. He has been able to pick it up pretty much since the Matchplay where he got the toughest draw of all, the weekend after he made a quarter final and a semi final on the floor, and next up in Ireland he'll win his board on the Friday and make the final on the Saturday, although his draw was a bit fortunate in that the best player he faced before losing to Suljovic in the final was Ian White. On TV he's had mixed results - if we look at Europe first, he's been in and out of the seeds, and has been solid in making the final day, but only managed to push through into the evening session once out of seven chances, although he drew van Gerwen once, Suljovic another and Wright the other four times in fairness. He also drew Peter Wright in Dublin, but would miss two match darts and then lose the deciding leg, but the last three majors he's at least got wins, beating Cullen before losing to Gurney in Hasselt, then in Wolverhampton, after getting through the wildcard qualifiers, he swept a group containing Chisnall, Mitchell and de Zwaan before running into Peter Wright yet again in the last 16, and last up at Minehead he beat van de Pas and Suljovic before falling to surprise package Jonny Clayton. Dimitri's here on the back of winning the world youth championship, with wins in the quarters onwards over PDPA qualifier winner Ted Evetts, Development Tour winner Luke Humphries (Humphries claiming that thanks to his nearest challenger playing an exhibition in Glasgow in the final weekend, one D. van den Bergh) and former worlds challenger Josh Payne. He would have got a slot here due to that, but has qualified outright from the Pro Tour. He's not done particularly well in domestic floor events, only winning a board twice and not finishing high enough to make the Players Championship Finals, but Europe is a different matter, where he qualified for eight events, reaching the final day three times through beating seeds Norris, Wade and Whitlock. That cash was enough to see him comfortably qualify for Hasselt, where he got a great draw against one of the last men in the field in Jonny Clayton, but could only win the one leg. As stated, he's still playing the Development Tour and has gained about as much match experience as anyone in the last couple of years, and he won three of those events this year, taking his career total to nine, and added on another two finals to that record. He also was able to qualify for the World Series of Darts final, and had probably his best TV run, beating Michael Smith and Raymond van Barneveld to reach the quarter finals, where he couldn't get it done against James Wade. 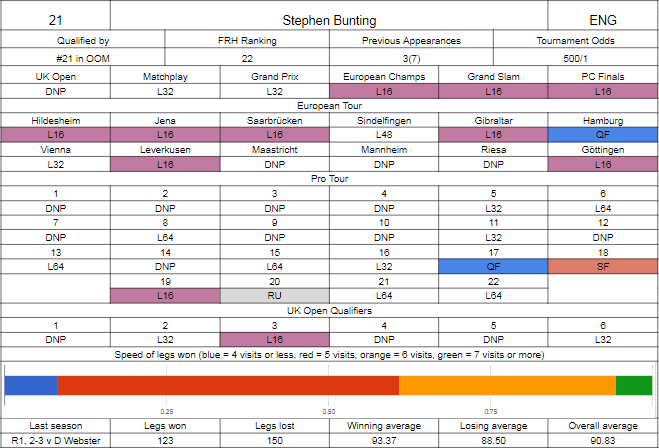 The bookies have this as quite even, and it's hard to call - Bunting's stats are looking slightly better in most categories, both players' form is trending in the right direction, it'll be hard to separate them and could come down to a deciding set. I can't see any value in this one really.